Easy Fine Dining! 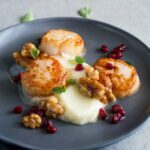 These Seared Scallops with Cauliflower Puree are perfect for a Valentine’s dinner or a romantic date night at home. The dish looks sensational but really is so simple to make, plus it is naturally gluten free, low carb and Keto friendly. You can serve it as a main course or an appetizer, AND the cauliflower puree can be made in advance! Treat someone you love this Valentine’s Day with a restaurant style seared scallop dinner! So if your significant other loves scallops why not try this seared scallops with cauliflower puree. I promise seared scallops will be super easy with my beginners guide! 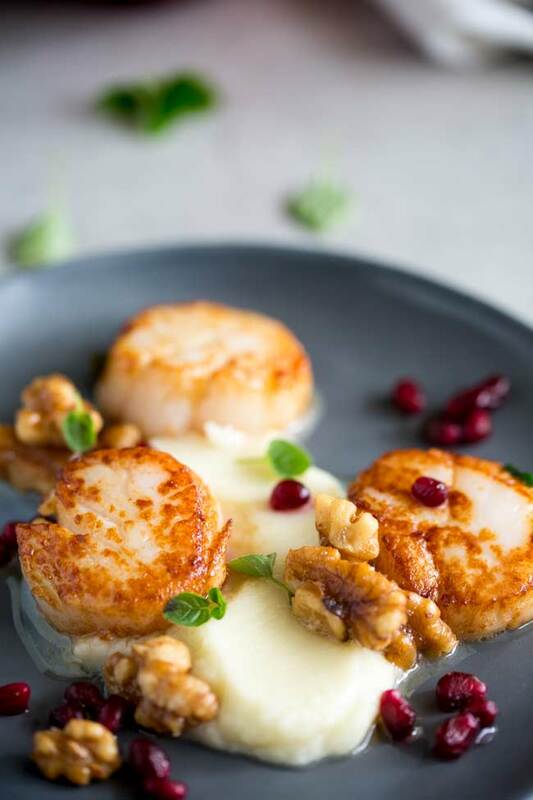 The creamy cauliflower puree can be made in advance, the seared scallops take just 2 minutes to cook and the walnut butter comes together in 30 seconds at the end in the same pan as the seared scallops. So this dish is great when you don’t want to spend all night in the kitchen. Scallops take very little time to cook, but don’t worry this simple method will have you cooking the most delicious seared scallops at home. To dry your scallops lay them on a sheet of paper towel and then use a second sheet to dab the tops of the scallops. You might need to repeat this process a couple of times. Once the scallops are dry they should feel almost tacky to the touch. The scallops can then be seared in a very hot pan with a little oil. Don’t add any butter at the start of cooking as the high heat will burn the butter and ruin your scallops. How long to sear scallops for? Some recipes will call for up to 4 minutes a side, please don’t follow that. The scallops will be tough and chewy. Scallops need no more than 2 minutes in total. The perfect seared scallop should be crisp on the outside and meltingly tender and succulent inside. The flesh will still have a touch of translucency to it, but be hot through out. To achieve a perfectly cooked scallop, the scallops are cooked in a small amount of oil in a searingly hot pan for 90 seconds and then flipped and cooked for a further 30 seconds with a little butter. This ensures the butter doesn’t burn and that the scallops don’t over cook. Also check out below the photo for the beginners step by step plan for searing scallops. Beginners guide to searing scallops at home. Start with very dry scallops. To dry your scallops lay them on a sheet of paper towel and then use a second sheet to dab the tops of the scallops. You might need to repeat this process a couple of times. Swap out the paper towel every time until the scallops seem almost tacky to the touch. The hot pan and hot oil mean that as soon as the scallops enter the pan they will start to sear and form a crust. This means they release less liquid, keeping them tender within and also stopping them steaming in the pan, which can leave them tough. Only salt the scallops just before you add them to the fry pan. Salt adds flavor but it also draws moisture to the surface of your scallops. Moisture will ruin your perfect sear, so we want to avoid this. Once you add the scallops to the fry pan, resist the urge to move them about. Let the scallops sear without touching them, this makes them easier to flip over as it allows the crust to form quickly. This in turn keeps the scallops soft and tender in the centre. Add the scallops to the pan in an ordered pattern. I use an imaginary clock face and add the scallops starting at 12 o’clock and moving around clockwise. I know this sounds a bit OCD but doing this means you know which scallop was added to the pan first, so it can be the first scallop you flip when the 90 seconds are up. Again ensuring that all the scallops are perfectly cooked and deliciously tender. Cauliflower has a wonderful affinity to seared scallops. The sweetness of the scallop works well with the slight sulfur-like flavor that you get with cruciferous vegetables. Plus cauliflower puree (or cauliflower mash) is low carb so you can win some brownie points there if you are dating someone on a keto or low carb diet. Making cauliflower puree is super simple and you can use fresh or frozen cauliflower. To give you the creamy smooth consistency and great flavor it is best to cook your cauliflower in some vegetable broth/stock with a little butter. This gives you great flavor and creamy texture without needing to add any heavy cream. The cauliflower will need to cook for 10-12 minutes until it is very soft. To check this, use a fork to stab the cauliflower. The fork should go in with no resistance. This soft cauliflower will yield the smoothest puree. Because we are cooking the cauliflower until soft it is important to let it drain well before you puree it. Otherwise it will hold onto some of the vegetable broth/stock and this will thin down the puree. You can use an immersion blender, bench top blender or food process to turn your cauliflower into a puree. They all work equally well. My preferred tool is the immersion blender as it is easiest to clean and works fast. But use what you have available. If all you have is a potato masher then this will work, but you will be left with more of a rustic mash than a puree….but hey that is cool! Can you make the cauliflower puree in advance? You sure can! In fact cauliflower puree heats up wonderfully! Once it has been pureed/whizzed/mashed, place in a microwavable container and cover it in the fridge. To reheat, give it 3-4 minutes in the microwave until steaming hot. p.s you can also buy cauliflower puree in the frozen food section of most supermarkets…..totally okay to cheat here. I mean you bought fresh scallops – you are killing it in the date night dinner race! 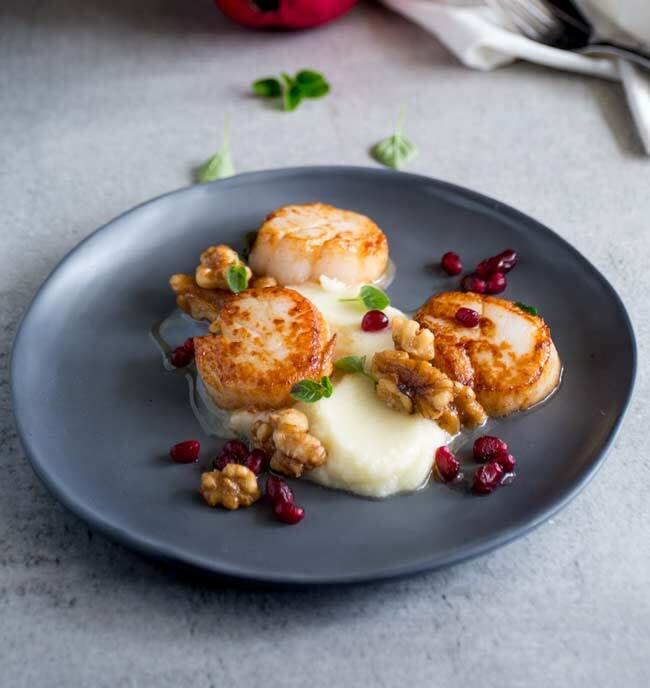 To add an extra layer of flavor and a touch more elegance to this seared scallop and cauliflower puree, there is a walnut butter and a quick garnish of pomegranate arils/seeds. Don’t worry, these are so straight forward and I have also given alternatives below. A quick walnut butter pan sauce. The beauty of the walnut butter is it can be made in the last 30 seconds as the scallops finish cooking. When you add the butter to the pan for the scallops, add in the walnut pieces and let them heat through in the melted butter. They gently perfume the butter with their nuttiness and become warm with a slightly crisp exterior. This butter can be drizzled over the seared scallops and the cauliflower puree at the end. Although this is such a simple pan sauce it is quite delicious. 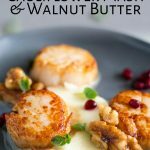 If you can’t eat nuts or just don’t have any then follow the recipe without the walnuts, the butter will still make a great drizzle for the scallops. Pomegranate arils are the small seed pods inside a pomegranate. They are clear jewel like nuggets of ruby-colored fruit surrounding a tiny, crisp seed. You can eat the whole aril and they are so good for you. Plus they taste great too! Pomegranate arils are often called pomegranate seeds. You can buy whole pomegranates and remove the arils yourself or you can buy pots of prepared pomegranate arils in the grocery store. Find them in the refrigerator in the fruit section. Alternatively it is becoming more common to find them frozen as well. There are two great methods for removing the arils from a pomegranate. You can either cut it in half and then whack it with a wooden spoon to rain down the aril. Or you can push the arils out when under water to easily separate them from the pith and skin. You can see both methods in this BBC video. If you can’t find pomegranate arils or don’t think you will find uses for the rest of the container, the you can serve this without the pomegranate and add a couple of lemon wedges. 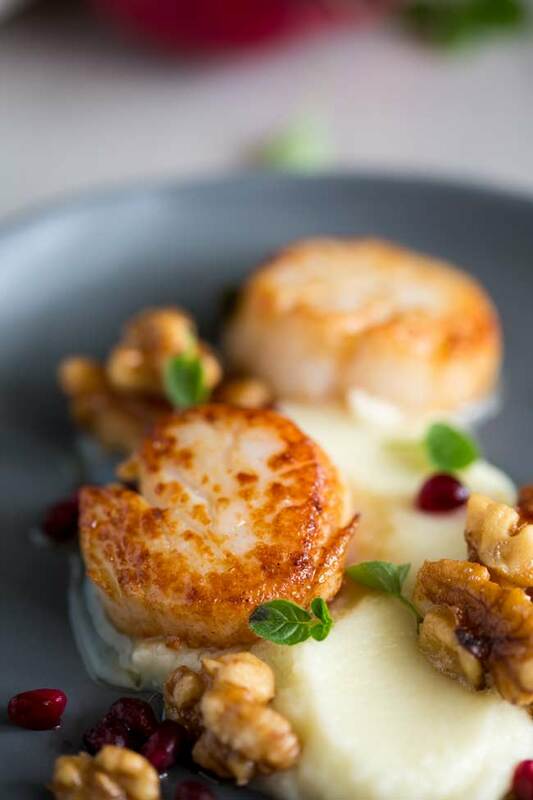 Pin this recipe for Seared Scallops with Cauliflower Puree and Walnut Butter. Pin it here. Easy Fine Dining! 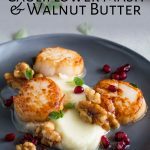 These Seared Scallops with Cauliflower Puree are perfect for a Valentine’s dinner or a romantic date night at home. It looks sensational but really is so simple to make, plus it is naturally gluten free, low carb and Keto friendly. You can serve it as a main course or an appetizer, plus the cauliflower puree can be made in advance! Treat someone you love this Valentine’s Day with a restaurant style seared scallop dinner! Place the cauliflower and the vegetable stock in a sauce pan then bring to a simmer and cook for 8-12 minutes until the cauliflower is soft. Drain the cauliflower well, reserving the cooking liquid. Puree the cauliflower using either a handheld immersion blender, food processor or blender. Adding in a little cooking liquid until you have a constancy that you like. First ensure the scallops are dry by patting them with paper towel to remove any moisture. Then leave them to sit on a sheet of paper towel. Place a heavy non-stick fry pan over a medium high heat and add the oil. Let the oil get smoking hot. Season the scallops lightly with salt. Then carefully and quickly add the scallops to the fry pan. Do them individually starting at 12 o’clock and working around the outside of the pan. Cook the scallops for 90 seconds on one side. Turn the heat off under the pan and add the butter and walnuts to the fry pan. Once the butter has stopped sizzling, add 3 scallops to each plate and spoon over the walnut butter. Garnish with pomegranate arils and chopped oregano/parsley. To do this, lay your thawed scallops on a sheet of kitchen paper and then pat the tops with a second sheet. Repeat this (swapping both the top and the bottom until the scallops seem almost tacky and sticky. This cauliflower puree heats up wonderfully! So if you want to make it in advance, once it has been pureed/whizzed/mashed place in a microwavable container and cover it in the fridge. To reheat, give it 3-4 minutes in the microwave until steaming hot. Adding the scallops to the pan in an ordered pattern means you know which scallop was added to the pan first, so it can be the first scallop you flip when the 90 seconds are up. This ensuring that the scallops are perfectly cooked and deliciously tender. Using a clock face is just an easy way to visualise the pan. 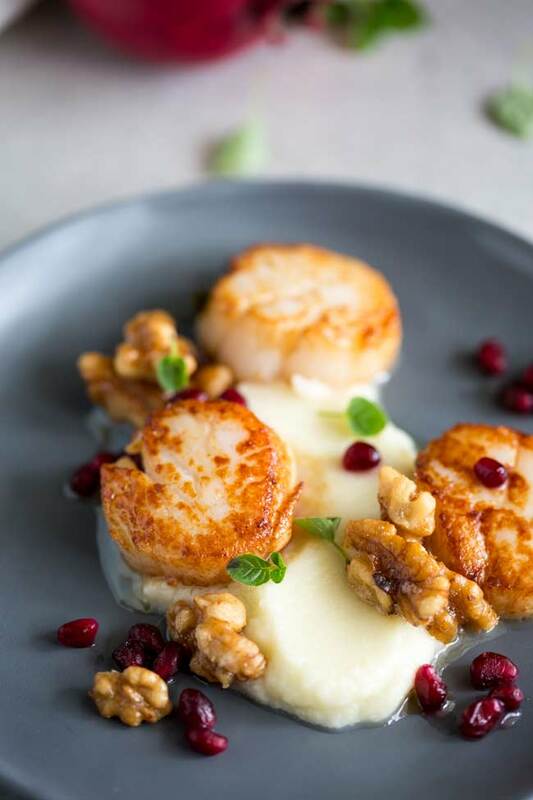 If you love food why not subscribe to my newsletter, I will drop you an email every now and then, just to say hi and send you a couple of recipes I think you might love, like these Seared Scallops with Cauliflower Puree and Walnut Butter. Wonderful combination of flavours, Thanks for sharing such an amazing recipes.. Thank you Molly, I just love Scallops! .Hi Claire! I know I haven’t been around in a very long time. Life has gotten in my way. 🙂 This dish sounds amazing! I absolutely love scallops and cauliflower! Hope is well with you and your family! I have missed our banter. Everything is going great here, my eldest started high school!!!! He is loving it, which is good, although he leaves the house at 7:15 now!!! !